DC has gone all-in on Batman in their line-wide relaunch, with a total of eleven Bat books. Add to that Batman in Justice League and Harley Quinn in Suicide Squad and you’ve got thirteen books of bat-adjacent characters. That makes Batstuff fully a fourth of DC’s entire schedule of relaunch! Of course, right now Batman is bigger business than ever before, coming off of a critical and box office smash movie and a high-selling and acclaimed comic run. Can DC continue the magic? And, on a more personal note, can they bring me to care about a hero I’ve always been cold to? If I had any fear that the opening issue of DC’s namesake book wasn’t going to live up to its “Detective” moniker, it was quickly quelled. Tony Daniels’ plot has each player running their own game while they play in others’ – the Commissioner in Batman’s, the police in Joker’s, and Joker in that of a mysterious attacker and benefactor. The result is a book where nothing happening is something. Yes, we get fight scenes and explosions, but they’re almost beside the point. The point is following each player as they manipulate the others to the last page, and then going back to the beginning to follow them again on re-read. If there’s one dead part of the narrative it’s a page spent with Dr, Arkham, who is one-note in his “he’s sick” diagnosis of Joker. Maybe that’s the point? I’m admittedly not a Bat-comics fan, so I’m not sure. What is surprisingly not one-note is the police’s pursuit of Batman. It was annoying in Justice League, but here it feels in context. I’m sure it’s not entirely a coincidence that this is where we left Batman in the last movie. Tony Daniel’s art makes my whole body tense. You know how some artists over-exentuate all of a characters’ muscles? Daniel is all about skin. All the little wrinkles and crevices around a smile or a grimace. 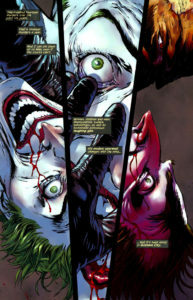 Every shot of Joker is downright unsettling, from the first one of blood trickling out of his nose to the disturbing final panel. Daniel sketches the traditional tall, skinny-headed Joker with the lithe body of a dancer, the face of your drunken great-aunt, a vicious hook of a nose. Batman is big, in a reinforced-armor version of his classic blue and grey. His bulk dominates panels, and makes his fight with Joker look alarmingly one-sided (it isn’t). Panels take time to drag your eyes across. Gotham’s dilapidated buidlings inhabit the background of the story in intricate detail. I’m typically put off by disembodied heads on comic covers as a lazy way to squeeze in another character, but … well, it works in the context of this issue in multiple ways. I’m not saying the Joker gets beheaded or anything. Just read it. 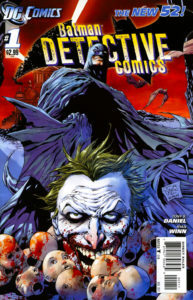 Note that the cover cynically inserts “Batman” above the Detective Comics title. Also, in my typical graphic design snobbery, I must note that Batman’s italic white on gray-with-bat-symbol narration boxes make my eyes glaze over. They take way too much effort to read. Detective Comics re-debut is a visceral thrill that forces you to linger on every panel. For new fans, this issue tracks almost perfectly from the closing frames of Nolan’s The Dark Knight, wisely tucking away any dissonance in the Batman universe for other titles to handle. As with Dark Knight, the Joker is the star of this issue, and every panel of his pale white form is both rewarding and nauseating. Batman himself is relatively flat here – but this isn’t a book about character revelations – it’s Detective Comics, and it lives up to that name entirely. Given how quickly the ending will send you back to page one, I have high hopes that the remainder of the arc will include several more circuitous turns.